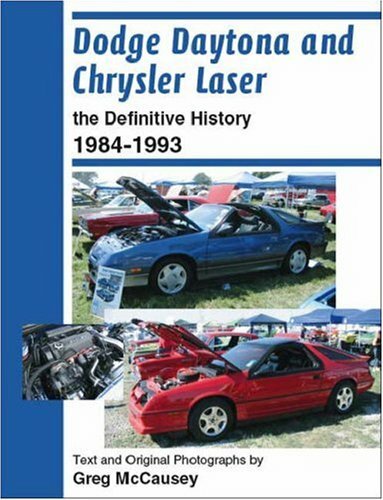 Product Description: Dodge Daytona and Chrysler Laser the Definitive History 1984-1993 is the ultimate book on the history of these popular G-Body performance coupes. For the first time ever, this book traces the complete history and development of the Daytona and Laser, from XE and Turbo Z, to XT and ES, all the way to Shelby and IROC R/T. Over 65 quick reference tables provide easy access to information such as engine output specifications, production totals, color options, powertrain options, and body specifications. This definitive history of the Laser and Daytona also includes 180 photographs, many in rich full-color, providing a complete, detailed, pictorial record of the development of these fabulous machines. Also included are excerpts from time-period reviews from numerous automotive magazines who road tested these cars when they first appeared on the automotive scene.